The upper level of the renovated home contains bedrooms connected by a combined living, dining and kitchen area. Clerestory windows follow the slope of the roof, visually connecting the bedrooms to the center living space. Porches run the length of the waterfront façade on both levels and extend outdoor living. Yet the most memorable room is a “seasonal porch” on the ground level that offers “an airy, flexible and crisply finished living space,” according to Arbonies King Vlock principal Sandra Vlock. The inclusion of a five fully retractable NanaWall SL70 Aluminum Framed Thermally Broken Folding Systems into the home’s unique porch on the south- and west-facing sides extend the living space even further out on to the deck and patio areas. They also seem to bring the water right into the house, the 15 opening panels running practically uninterrupted across the façades. Writing about the Guilford Beach House, Connecticut Cottages & Gardens magazine admired that “The beauty of this architecture is that it connects to its place. And it’s hard to delineate when you’re inside the house where the line of the house ends and where the landscape begins.” The NanaWall's SL70 system is the design tool for creating this illusion: When open, it creates the tenuous transition between the enclosed living spaces and the open air of the Connecticut coastline. The glass walls also help create a sophisticated and modern take on the traditional low-lying cottage, capitalizing dramatically on the beautiful ocean views. 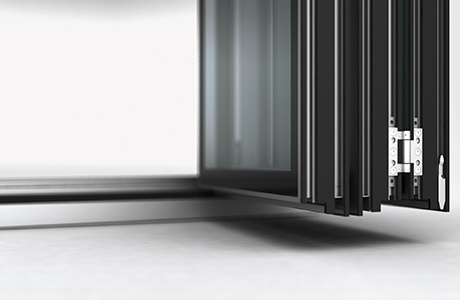 The glass folding panels of the SL70 aluminum-framed system, along with matching transoms, can be tightly closed off for efficiency and protection, depending on the weather and occasion. The panels feature thermally broken frames for reduced energy use and increased occupant comfort – a big plus on the often cool and windy Northeast coastline – as well as high-performance glazing. 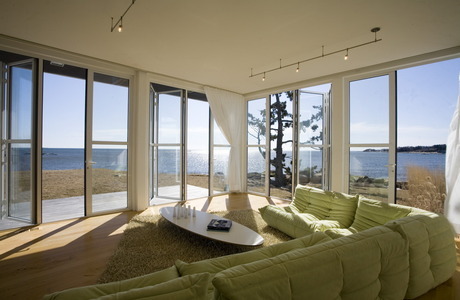 Ease of operation of the panel system and security at the Guilford Beach House has been well considered, too. For sliding and folding each pair of panels, a patented, floor-supported lower running carriage is attached as a guide, ensuring smooth running and equal distribution of weight on the rollers. Multi-point locking and a deadbolt consisting of push/pull handles on both sides are provided for each folding panel set, making security effortless. “Our ambition as architects for this home was not simply to frame the view but to become one with the landscape. The NanaWall system achieved this in one elegant and dramatic gesture. It defines the project and the experience of living in this remarkable place,” according to architect Sandra Vlock. "NanaWall allowed us to create uninterrupted views to the Chesapeake Bay and open the west wall of the Loblolly House, effectively transforming the interior of the house into a porch."